Since many years I am dedicated to the conservation of nature and for almost a year I work with passion as Rewilding Manager at Rewilding Europe. Last months, an experience in nature and a notice in the newspaper made me think through a rewilding perspective. I’m in Velebit (Croatia), visiting a large hunting reserve. 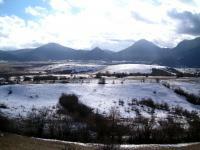 16,000 hectare of snowy hills and large open areas. We see some small groups of roe deer, and just in front of us a majestic Ural owl flies away. The fields show signs of abandonment, there’s no farmer left. The few scattered villages are practically abandoned. It’s the outcome not only of the process that occurs throughout Europe, but also as a result of a fateful war almost 20 years ago. The manager of the hunting area, while driving slowly along the snowy tracks, proudly tells me about the number of deer and bears he has. He stops and shows us recent wolf tracks that cross our way. He asks me advice in building hides, hides that could bring in photographers and naturalists to observe the wildlife. He tells about the responsibility they have to take care of the wildlife, not only to hunt it. This land is his home and he likes it this way: wild and full of wildlife. I read in the Spanish Quercus magazine that wolf watching tourism in Sierra de la Culebra generates half a million Euros per year. Sierra de la Culebra, in Northwestern Spain, might be the area with the highest density of wolves on the Iberian peninsula. The first time I went there was more than 20 years ago. We stayed at the only guesthouse of the area and half a dozen locals turned to see “those crazy bastards who enjoy watching the wolves, that damn animal”. I am driving on the track that leads from my home to the nearby town, making a shortcut. It is always nicer than the main road and you can enjoy a landscape of forests, fields, and in some places views of the river. At night, you see rabbits, hares and even a fox or a badger. During the day the largest visible animals are the abundant buzzards. But this morning, tosurprise, there are four male fallow deer in a field. They don’t seem to be very afraid with our presence, I can even take a picture with my mobile phone. Great news! The poor pine and oak forest has suddenly become a mysterious place inhabited by fallow deer. All these stories in the first person have a thread of consistency: reconciliation. In Europe we are reconciling with wildlife. It is a psychological, social and ethic process, which “affect” a significant part of the Europeans, even in rural areas. This reconciliation together with the abandonment of large natural areas, provides Rewilding Europe a historic opportunity that we must seize. Let’s go for it!